Two of the top video game stocks have lost over 25% of their value this year. It's been a rough year for the broader market, particularly in the past several months as volatility has skyrocketed amid concerns about slowing economic growth and rising interest rates. 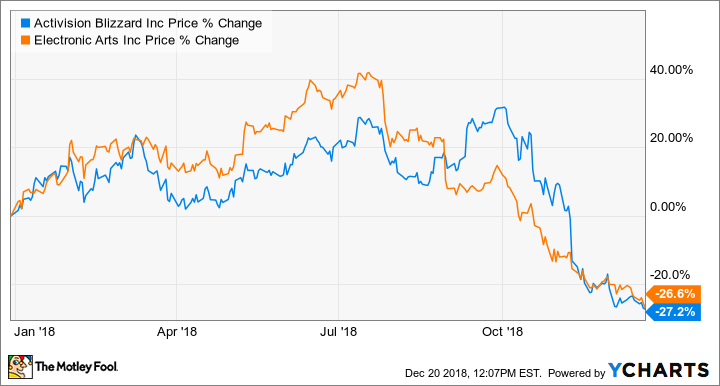 Two of the most prominent video game stocks -- Activision Blizzard (NASDAQ:ATVI) and Electronic Arts (NASDAQ:EA) -- have now fallen into negative territory in year-to-date performance, with both stocks down over 25% for 2018. In addition to market choppiness, Activision Blizzard's third-quarter earnings release failed to impress investors. Shares fell 28% in November, mostly due to the company's lackluster guidance for the all-important holiday shopping season. Revenue in the fourth quarter is expected to be $2.2 billion, with adjusted earnings per share of $0.64. Perhaps more troubling was an admission that Activision Blizzard's overall player base declined in the third quarter, despite several prominent product launches. Total monthly active users (MAUs) across all segments fell from 352 million to 345 million on a sequential basis. Call of Duty: Black Ops 4. Image source: Activision Blizzard. Call of Duty: Black Ops 4 was a bright spot, growing engagement for the Activision segment following the title's release. On the mobile front, the King segment is losing traction. Simply put, several of the company's core franchises are underperforming relative to expectations, and that has rattled investors. Electronic Arts stock started to decline at the end of the summer following the company's fiscal first-quarter earnings release, and fiscal second-quarter earnings couldn't turn the tide. Much like Activision Blizzard, Electronic Arts also issued a soft forecast for the holiday shopping season, which was primarily attributable to a delay for Battlefield V. Electronic Arts pushed the release back in part to distance itself from competing titles like Activision's Call of Duty: Black Ops 4 and Take-Two's Red Dead Redemption 2; Battlefield V launched in late November. Battlefield V. Image source: EA. The company is struggling to get players to sign up for its FIFA Ultimate Team subscription service following the release of FIFA 19. However, management is optimistic that it can get more players onboard with live events going forward. EA is making overall progress growing digital revenue, which now represents nearly 70% of total net bookings. It also didn't help that prominent institutional investors have abandoned the stock. At least nine different hedge funds sold off their entire positions in the third quarter following news of Battlefield V's delay. Another trend that is negatively affecting both EA and Activision Blizzard is the soaring popularity of the battle royale genre, most notably Epic Games' Fornite, which launched in 2017. Epic said it had nearly 80 million MAUs in August, and now has 200 million registered players. Other titles like PlayerUnknown's Battlegrounds similarly enjoy robust engagement. EA and Activision have now gotten on the battle royale bandwagon, with Battlefield V and Call of Duty: Black Ops 4 both having battle royale game modes, but the game makers were undeniably late. With both shooter titles launching in the fourth quarter, it's too early to say whether their forays into the genre are successes.